From this, it is clear that virtual testing must supplement physical testing, and be constantly iterated to gain sufficient confidence in the operational safety of autonomous vehicles. To accelerate the development and continuous extension of your virtual test environment, MSC offers virtual environment modeling services. These services include 3d scene modeling, sensor model design, implementation, and verification, scenario development & execution and custom reporting. Road or Street Furniture – Traffic control equipment including signs, signals, lights, guardrails, complex roadmarks, overpasses, bicycle lanes, etc. Road Surfaces – Concrete, asphalt, cobblestone, etc. Sensor Building: From RADARs, to cameras, to ultrasonic to LiDARs, a host of standard and unique sensors can be modeled and incorporated in the virtual environment. The performance of these sensors can be evaluated based on off-the-shelf performance, or parameterized to evaluate sensor performance under unique conditions (angle, width, beam quantity, scan speed, signal processing, etc.) Users may extend and customize the models further using the same SDK capabilities that are the basis for the original sensor model implementation. Scenario Development & Execution: In order to test the myriad of potential locations, conditions and situations that an autonomous vehicle will face, driving scenarios can be developed. These can range from tests based on government standards to unique scenarios that are too dangerous to test physically, but must be tested in order to ensure the highest level of safety. Each scenario is built to exacting specifications – to match the real world as closely as possible. Furthermore, custom actors and/or situations can be overlaid to produce unique test scenarios intended to validate algorithm performance and robustness under a variety of conditions. Moving Objects – Pedestrians, cyclists, animals, etc. Weather conditions – sun, fog, rain, snow, sleet, etc. Driver models and driver parameterization. Data Filtering and Analysis: As with physical testing, millions of miles of virtual testing generates a substantial volume of data for post-processing and analysis. Leveraging MSC tools, safety indicator reports can be quickly created to synthesize results to help engineers assess performance during each event. 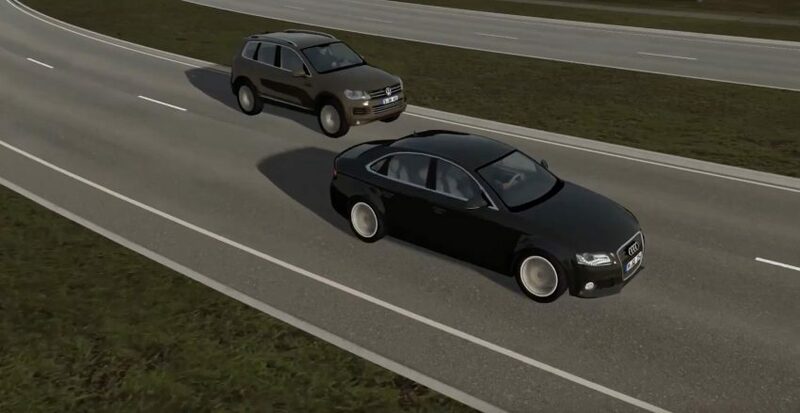 Effects of Vehicle Dynamics: Critical to achieving a high and reliable safety quotient is the incorporation of an accurate vehicle dynamics model into the driving scenarios. With MSC’s comprehensive tool chain, this requirement can easily be met. Physical to Virtual Correlation: Leveraging the tools above, MSC can merge the physical and virtual worlds to enhance confidence. Using customer supplied data from physical testing coupled with results from virtual testing, validation metrics can be developed to quantify the accuracy and performance of either the virtual environment or vehicle control algorithm(s). Leveraging these metrics optimization strategies can be overlaid continuing to drive improvements in performance. What is the software behind the Autonomous Vehicle Modeling & Simulation?